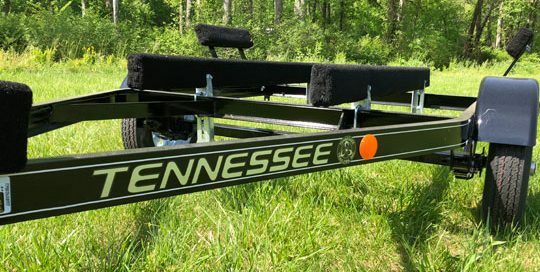 Protect your investment by choosing a boat trailer that is durable, reliable and built to fit your boat properly. Hauling your boat safely is extremely important, you need a trailer that tracks properly behind your vehicle and is built to cushion the boat and keep it secure when driving on the highway as well as those rough back roads. The Legendcraft trailers are custom made with the same outstanding quality and workmanship found in our boats. Choose between EzTrac Aluminum or Tennessee Steel Trailers below. 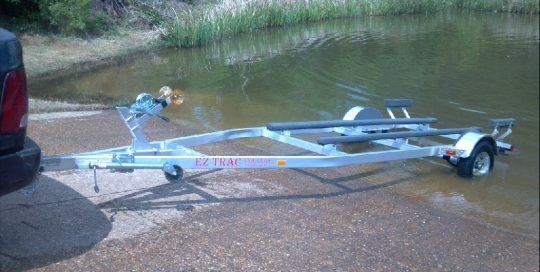 Our EZTrac Aluminum trailers are built to last and designed to ensure your boat is safe and secure. Featuring heavy gauge steel for durability, our C Channel Steel Trailers are custom designed and manufactured to fit your Legendcraft hull. Their trailers use heavier gauge steel than other manufacturers for the longest lifespan in the industry. NMMA Certified to Meet or Exceed all SAE, US DOT. Order a trailer with your boat. When you use our build a boat form, the trailer will be available as an option.